Following the closing arguments in a murder trial, the 12 members of the jury must deliberate, with a guilty verdict meaning death for the accused, an inner-city teen. 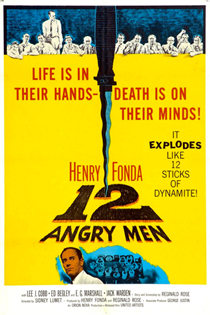 As the dozen men try to reach a unanimous decision while sequestered in a room, one juror (Henry Fonda) casts considerable doubt on elements of the case. Personal issues soon rise to the surface, and conflict threatens to derail the delicate process that will decide one boy's fate. Cine-real is one of the only film clubs in the UK to exclusively play films in their original 16mm format. Cine Real is a non-profit organisation which aims to unite film makers and enthusiasts in their appreciation of classic film.